Clean and protect every surface of your home. Wood is a remarkably beautiful and easy to work material – which is what makes it such an excellent building product. 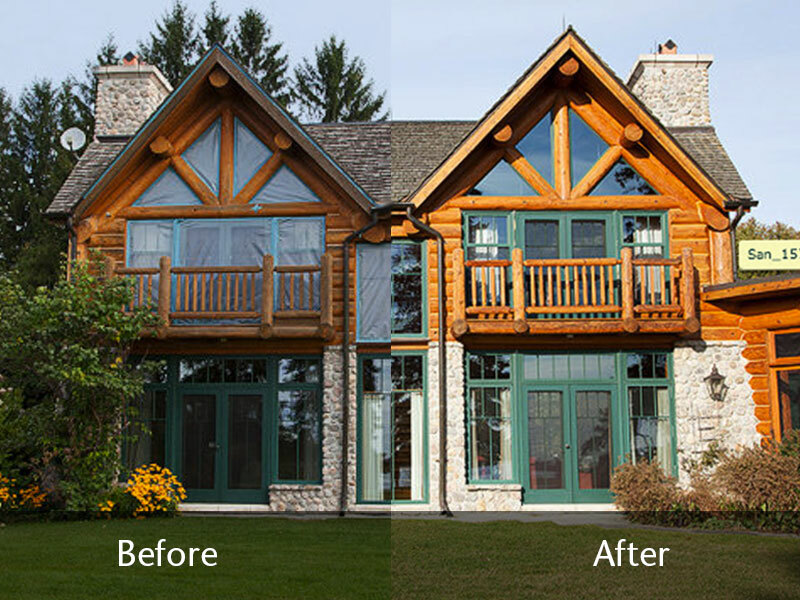 It’s also easy to restore if your finish hasn’t been properly maintained (or even if you’re just looking to change the color or finish). Selecting the right products and tools and following the right steps will give you the best results and help save time and money. First consider your surface texture. Wood surfaces generally fall into three categories: smooth machined (planed); rough sawn; and hand hewn or draw knifed (textured). Each of these surfaces demand specific preparation techniques to restore the wood surface without destroying it’s texture or character. For removing old finishes, cleaning weathered wood or removing fungi and mildew cleaners can be very effective, especially for DIY projects with smaller surfaces. Larger projects can be more challenging and professional help is recommended. Cleaners often leave behind partially loose fibre and so smooth machined or planed surfaces must be sanded particularly well to remove it and create a consistently level and porous surface prior to finishing. 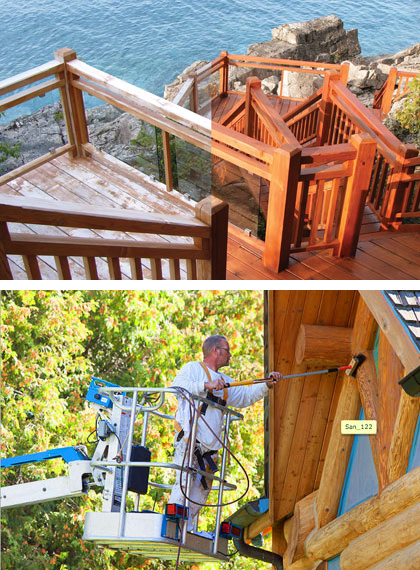 For rough sawn surfaces, cleaners are likely the most appropriate solution. After cleaning and rinsing well, the rough texture of the surface is ready for application. Draw knifed and hand hewn surfaces should only use cleaners but test your technique carefully in advance to avoid leaving behind loose hair-like fibres – sanding after cleaning is not really an option because it would destroy the ridges from the knifing technique. For planed and machined surfaces in dry conditions, power sanding alone may be the best option. It generates a porous, level surface that performs well for all finish applications. 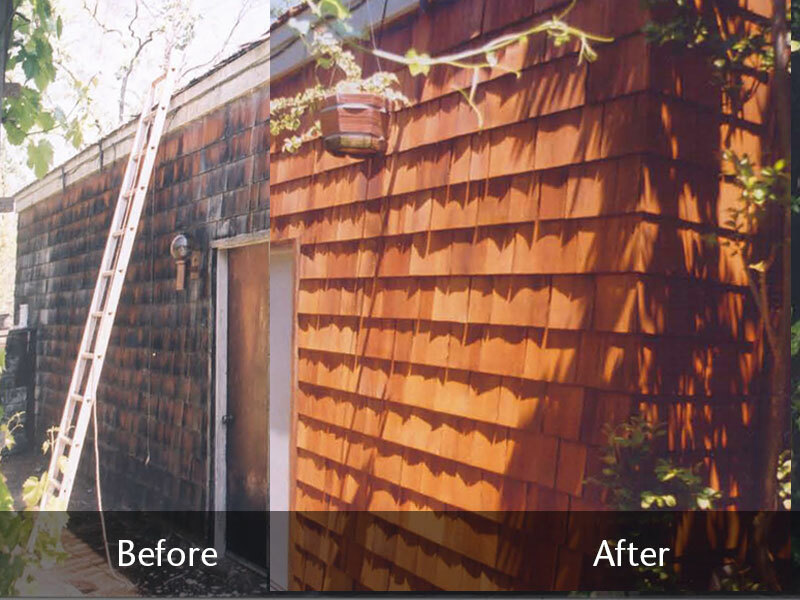 Blasting with dry media (soda blasting, walnut shells or sand) is effective at removing worn surface coatings or weathering without wetting the wood. For larger projects this technique is generally preferred as it is fast and cost effective compared to liquid cleaners. It’s extremely important to avoid unnecessary erosion so ensure you work with an experienced operator using quality equipment and materials. Sanding after this process to smooth the surface is worth considering – the better the level of preparation, the better the finish of your project will look and perform. 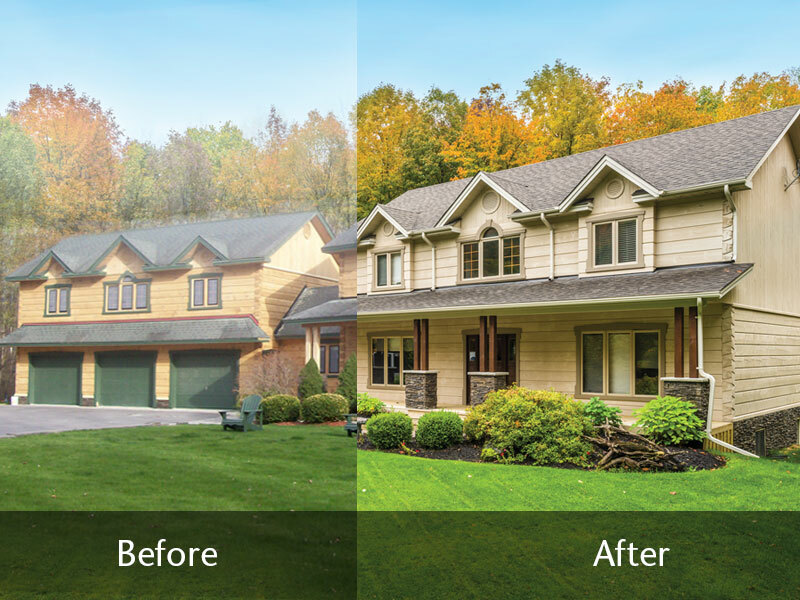 Sansin offers highly effective cleaners for every job – whether preparing for a recoat of an existing Sansin finish, restoring weathered or dirty wood to a bright new surface to help prepare for finishing, or removing old finishes from the surface while simultaneously restoring the natural color of your wood – we have the best in class cleaner for your project. Sansin’s family of cleaners offer great value due to the effectiveness of the formulas and the concentration that often allows for dilution while still getting the job done. To help you decide what the best restoration technique for your surface is, contact your local Sansin dealer or Sansin Technical Representative. Providing a photo of the job and the surface in question will help us work with you to determine the best course of action. But remember – it is critical to test your cleaning, wood preparation and finishing techniques on an inconspicuous area to ensure desired results. Highly effective in removing unsightly weathering, mold, algae, mildew, staining and extreme oil and grease. Restores wood quickly. Concentrated cleaner that easily removes mildew, dirt, rust stains and more. Power washer ready. 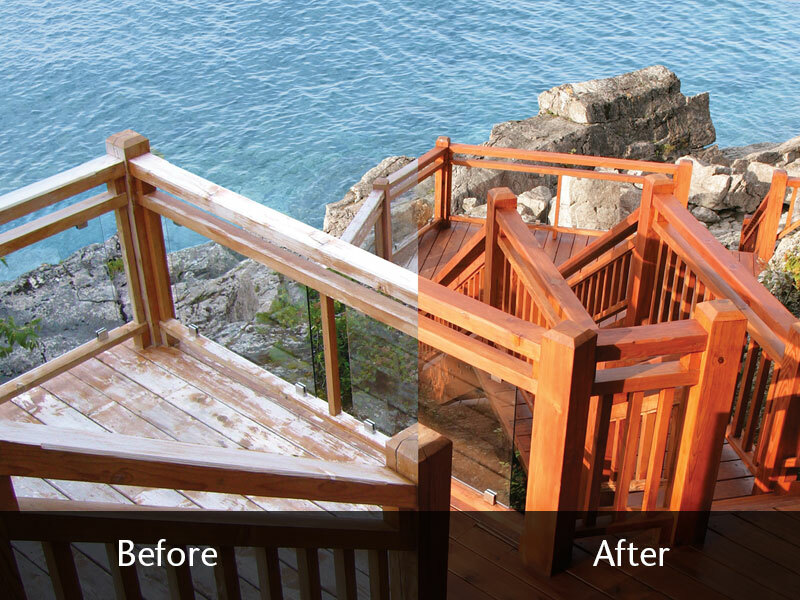 Removes old stains and paints while restoring wood. Biodegradable, rinses off with water. 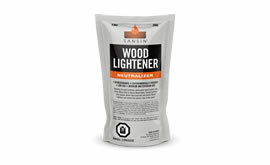 Effective wood lightener for bare wood surfaces. Biodegradable cleaner and lightener that effectively brightens and removes mold, iron, weathering and other discoloration commonly found on wood.